With the #1 and final pick on my top 20 MC's EVER list is the late Frank White. Now before half of ya'll rap cats start with the whole "how can Big be the best MC ever and he only had out 2 albums?" beef, I've got a couple of answers for that argument. #1, the amount of songs they are placed on albums have contiously grown since the 80's. For example, albums released between 1971-1985 had an average of 8 songs on it. While albums released between 1993 to present have an average of 15 songs on it. So if we look at Rakim who had 30 songs with his first 3 albums and we look at the number of songs that BIG had on his 2 albums which is 38 it seems like that whole "but he only had 2 albums" argument gets shot in the foot real quick right? Secondly, these new wave cats REALLY don't know how deep BIG's discography goes. I was in the barbershop one day arguing with my barber about who was better BIG or Pac (BTW, I never know how cats even form their lips to say Pac was better then BIG) and my barber breaks out his Pac's greatest hits CD. So, I'm like let me go get my best of BIG out the whip but since I was in the chair this other dude says "naw, I'll get my BIG's greatest hits out my car." And I look at money like, "trust me fam, YOU'RE BIG's greatest hits isn't MY best of BIG mix." But he goes to get it and it's just what I expected, some off brand greatest hits album Arista put out. Then I went and got mine which help to shift the majority of the barbershop over to my side of things. See, my mix had "Dreams", "Come On" with Sadat X (the ORIGINAL Lord Finesse banger), "Real Niggaz Do Real Things", etc. You know those mixtape bangers that made "US" fall in love with BIG in the first place. And that "US" I just spoke of has A LOT to do with my argument. If you weren't in the mix during the 90's and you were 8 years old when "Warning" came out then you're 9 times outta 10 not gonna get what I'm saying. See, so much of music TRULY deals with the fact that you had to be there. Cause no matter how many books I read on Marvin Gaye's life, no matter how many times I listen to "What's Going On" backwards and forwards, I'll never truly GET what is was like when "What's Going On" dropped. That's why I'm not mad at dudes who are 34 and under who scream Jay Z is the best at the top of their lungs cause they just don't get it. And one more thing for the "he only had 2 albums" argument, I have literally heard DJ's (BTW, that "apostrophe s" means more then one) spin a 3+ hour set on BIG. Did ya'll get that? 3+ hours! Let's see a DJ TRY to spin a 2 hour set of your favorite MC and not bore the crowd half to death.So with the whole "BIG only had 2 albums" beef out the way, what's some of the other hoopla I hear? Oh yeah, the whole "well, if BIG was still alive he would have probably fallen off." Well, I don't live my life on words like "probably" but if I did then I'd "probably" disagree with cats who feel that way. The moral is no one knows what kind of music BIG would be dropping if he was alive cause he's dead. And to try to say he shouldn't be ranked at #1 because "he probably would've fallen off" is just dumb. Now that we have the major two beefs I hear all of the time outta the way, lets start talking about why my dude deserves to have the #1 spot on lock. For me, the same way cats hail Rakim as one of the best of all time because he ushered in an entire new rhyme style in the late 80's, is how I feel about BIG. And it's not that he necessarily brought a new rhyme style to the game but he brought the blueprint on how to be a successful MC to the game. Now, some cats may argue that it was Puff's plan that made BIG so successful and that's true. But just ask Mike D'Antonio how you can have the best 14 seconds or less offense in mind but if you don't have the right player to run it, your plan don't mean ish. 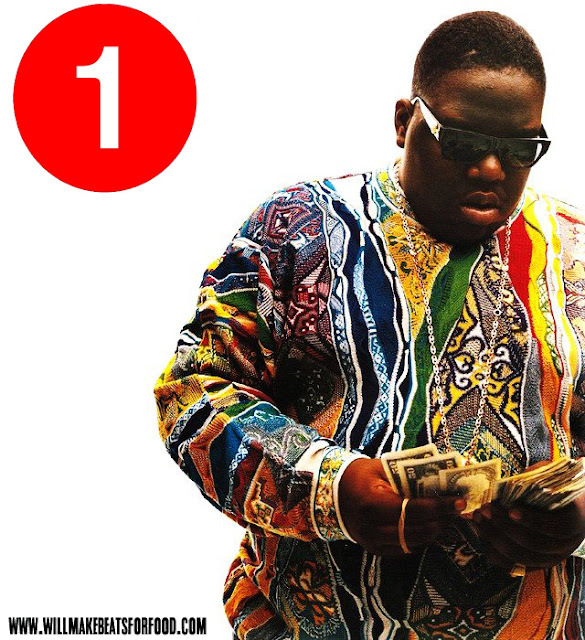 And every MC under the sun has tried BIG's blueprint and not one MC has been able to pull it off like BIG did. It's like trying to get Raymond Felton to be Steve Nash...it just ain't gonna happen. I remember the first time I heard BIG. I was in my man Osei's car driving up Loch Raven in Baltimore listening to 88.9 and they played "Party and Bullsh-t" and we were all like "who is this?" with that ugly scrunched up look on our faces. And for the next year whether it was on a Clue, Doo Wop or S&S mixtape this dude BIG just kept hitting us in the head over and over again with banger after banger. Even after his classic "Ready to Die" (yeah, I said classic cause some folk don't believe it was) dropped, BIG KEPT hittin' us off. One day I was out on the Bridge at Morgan State and my dude YZ from Jers pulled up in his max blasting "Who Shot Ya" and I got that same feeling I had from hearing "Party..." years ago...but times 10! And I know cats love to throw the "well, Life After Death isn't a classic" shot at me all of the time (and I don't disagree...it's a 4.5 at best) but don't cats try to front and act like when "Life..." dropped that it was EVERYWHERE! I remember being in Circuit City the day it dropped and the store was blasting "Life After Death." And make sure you get me on this, it wasn't just the CD department blasting the album but the ENTIRE store! Then when I had to go pick up whatever I copped, the dudes bringing the boxes out were banging "The 10 Crack Commandments" and knew every word! Did ya'll get that? Cats knew EVERY WORD and the CD JUST came out! See, you'e favorite MC doesn't make magic like that happen do they? Naw...they don't. And before my Jay Z fans (or stans) come in trying to throw rocks at the throne, let's get one thing straight. That Jay Z wouldn't be the MC that 90% of ya'll follow behind like the Wizard of Oz if BIG was still breathing. And that's not a "probably" statement...that's a FACT. See, when BIG was alive, BIG was pushing 5 million units to Jay's 500,000. So from the door, the public made their choice on who they were rocking with. See, there's only one top spot and BIG had it. Ya'll remember when Allen Iverson and Stephon Marbury got drafted back in '96 and both dudes were mad similar? Both were point guards, both were from the hood, both had tats before it became the national tradition, etc. but at the end of the day who did the public rock with? Iverson. And you know what? Steph spent the majority of his career trying to get whatever Iverson had but never really came close. And the same can be said for Jay. Those little shots he's fired a BIG ("and if I'm not better then BIG/I'm the closest one" or the ultimate low blow "it's no biggie/I'm the king now") over the years (and who takes shots at dead folk? I guess Jay does since he's 0-1 in rap battles with the living. I guess he figures he has a better chance with the dead) is Jay DYING to get us (the public) to say he's the best. And it doesn't matter how many of ya'll flock to his shows, buy his records, wait on his every rhyme to see how ya'll should dress now (Jay had cats throwing $500 jerseys in the trash for button ups), what to drink (how many of ya'll stopped drinking Cristal and started drinking Ace of Spade?) etc. Trust me, Jay KNOWS in his heart of hearts, that he'll NEVER get the love that BIG got and more importantly, he KNOWS he'll NEVER be the MC BIG was...and truth be told, so do ya'll. Salute to the best EVER! Categories - blog, Who's The Best MC?